So I have some exciting news- for me, at least, and hopefully for you, too! Goodwill Industries of Upstate/Midlands South Carolina has re-vamped their blog with an entirely new team of writers, including yours truly. We are a wonderfully diverse team of bloggers– fashion thrifters, DIYers, foodie writers, and home decorators who will bring you new projects and ideas throughout each month. Goodwill is obviously our thrift shop of choice, but it’s just a great idea to spotlight the idea of thrifting and buying secondhand goods. You all know I’m a big believer in it- and a lot of you are, too- so I’m definitely looking forward to yet another way to keeping the “buying used” movement going! But when I opened him up, I found that he was chock full of amazing illustrations! Turns out he’s a nature atlas from 1952. Thanks to the internet, people are unloading their old encyclopedias and similar-type books. But a lot of them are a treasure-trove of gorgeous photos, drawings, and illustrations that are begging to become wall art. Speaking of which, I needed a picture frame. Since the illustrations were on the small side, I wanted one of those “collage” type frames. You know the kind I’m talking about, right? The kind that come with that paper photo divider in different sizes and shapes? Well, I see them all the time at thrift stores, and snapped one up. That’ll do quite nicely. And it was never used! When I returned home, I was so excited that I got to work right away. First things first, I took apart the frame. I wasn’t super excited that the photo divider was cream and gold…but when I flipped it over, it had a lovely bright white finish- perfect! I went through my atlas and selected the illustrations that I wanted to use- saltwater fish species. So, I started to cut them out and taped them carefully to my photo divider. Isn’t that fantastic? Worked like a charm. I loved how it looked! And when I finished filling all the gaps, I ended up with this. This is looking so good! Since the fish illustrations had great hues of blue and green, I chose a deep lagoon teal to paint the frame. I knew it’d pop against the white photo divider, too. Done and ready to hang! How great is that? I just love it- the perfect gift for someone who loves fishing…or in a beach house…or to personalize an office. 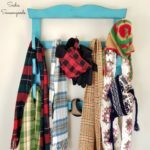 So there you have it- my first Goodwill blog post. And I’m already working on September’s project…here’s a hint: Think Caffeine. Congratulatuons on your Goodwill gig. I love goodwill and will always shop their stores. I love your framed art. I don’t look at the books very often but I might have to now. Love it! Love the Goodwill upcycle! I love doing that so I’m looking forward to your great ideas. Thanks, Deb!! I really appreciate that. Happy Friday!! My typing was atrocious… that should have said Good Will does GREAT things! I stop buying from Goodwill because for a while their prices werevtoo high. But in my recent visit, found out they have a new price policy with great new low prices. Im so happy about it. I’ve run into that same thing at various thrift chains. I think it’s always a struggle to keep prices reasonable given how popular thrifting has become. I hit all the thrift stores around here–Goodwills; Red, White and Blue (Vietnam Veterans) store;Deseret; Salvation Army, and all the little ones! I hope you find some good treasures!! Love it!! Let me know how yours turn out!! I love this, Sarah! Goodwill is my go to store for frames. I found the collage frame I used for my map project there and it was brand new, still in the plastic. Your wall art looks great. What a fun project and congrats for your new opportunity, that would be so fun! What a great idea! Looks great! Thanks for linking up on The Handmade Hangout! You did an amazing job on this project! I especially liked how you flipped the mat over – and the paint job on the frame! A super idea! I do have trouble cutting up books, though–especially vintage editions. But this is fab! Another problem I have is running out of wall space for all the cool Goodwill finds I can edit and repurpose once I get them home. I’m a bit inundated at present and hubby is wanting us to offload at a yardsale this month. Gah! I usually have the intention of putting things on Etsy–but my writing projects keep me from dedicating time to such a hobby. Ah . . . me . . .
Ha, I totally get it. I have an easier time justifying it with a book from the thrift store, though…I figure, someone else was able to get rid of it/didn’t love it anymore…and Lord only knows how long it has sat or will sit, collecting dust in the thrift shop. So, I’m hoping to do it a favor by showing off its pretty pictures in a frame!! Great idea! I love using old book illustrations for artwork. It’s so impactful and costs almost nothing! Thanks for sharing at Inspiration Thursday! Happy Labor Day weekend! Stopping by from the Show and Tell Link Party. 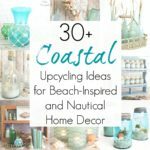 What a great upcycle project! And could be adapted to so many different tastes… old cookbooks for the chef in the family, etc. The wall art is great Sarah! I have had my eyes out at our local goodwill for a botanical book for some time now, but haven’t ran across one. 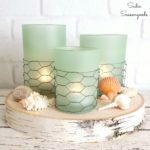 These photos are perfect for a beach theme! Congrats on being selected to help with the blog. Sounds really fun! Thanks for sharing with SYC. Congratulations! They couldn’t have picked a better person to help on the blog. You are so talented and you always blow me away with your creativity. What an awesome idea to make pretty wall art. Have a nice week and see you again. This is a really great way to upcycle and give something a fresh start! Thank you so much for sharing and linking up with us over at the Welcome Home Wednesdays Link Party!